In 2018 Exhibitors and Sponsors carried out showing live demonstrations of their latest products and equipment. 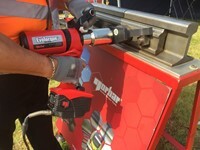 Hilti will be demonstrating pandrol key removal using their TE1000 breaker and special insert (aiding safety and easy removal of clips).They will also be demonstrating their unique rack circuit connection system (for signalling teams) easy installation with this approved Network Rail system and bonding cable installation using their GX & BX gas tools and special clips fixing into timber & steel sleepers. They will also be showing their unique track circuit connection system ( for signalling teams ) easy installation with this approved Network Rail system bonding cable installation using their GX & BX gas tools and special clips fixing into timber & steel sleepers. This year Hird will be hosting LIVE demonstrations of the Cold Hole Expansion CBX Kit (as specified by Network Rail and London Underground, available through Hird Rail as the distributor Worldwide). 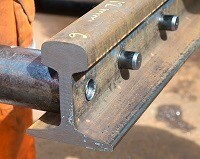 This is a process performed on a predrilled fishplate hole in the web of the rail. As a carefully selected oversized mandrel is hydraulically pulled through the hole it induces a zone of compressive residual stress immediately around its circumference. 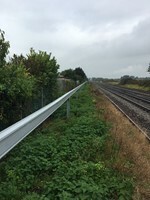 This process has been implemented to drastically improve the fatigue life of rail at the bolt hole and protect it from cracks occurring, this life enhancing method is specified on all new rail installed in the UK and can be undertaken on existing in-track bolt holes during maintenance of joints. Thermit will be using demonstrations each day to showcase new technologies in rail welding. 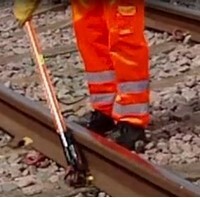 Jafco Tools Ltd have taken the original design concept for an e-clip removal tool, created by Roy Evans and Toby Keates of Network Rail and further developed it to create an efficient, fast, cost effective and innovative tool which has safety as a key design element. High Speed 1 is showcasing the latest in Augmented Reality and Holographic Projection (AHP), as well as 3D Laser asset scanning technology. This year, High Speed 1 is exhibiting at Rail Live in partnership with NRHS and UKPN Services at stand W94. NRHS will be demonstrating how Microsoft HoloLens headsets are used to project digital assets into the real world. This technology transforms any space into a low cost training environment for maintenance workers, improving training and reducing the amount of time spent on track. UKPN Services is exhibiting its 3D Laser scanners and will discuss how this technology is playing an important role in bringing existing assets into a BIM and Model environment. For the first time in the UK Dualinventive will be demonstrating their new, modular and completely wireless ATWS 3000, which has been designed with ease of use and user flexibility in mind. Aiming to make warning systems more accessible, they have developed an interactive planning tool using our Cloud platform MTinfo 3000 to simplify the process, giving control back to the users, system control and paperwork is delivered to site via a mobile app. Entwistle will be demonstrating the Latest Rowe VarioFold Plan Folding Machine along with the 36" wide Colour Scanner from Rowe. 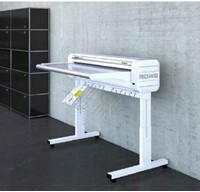 The Rowe VarioFold is the only drawing folder on the market that is able to fold drawing up to 30 metres in length. Entwistle have been supplying this type of folding machines to many of the UK's leading Rail Design Offices for a number of years. Previously the folders we supplied could only handle drawings upto 4 metres in length. We wil also be demonstrating the Rowe 450i wide format Colour Scanner, which provides high resolution scan quality for drawing and documents. Entwistles also provide a wide range of Print Services to rail professionals and we will be exhibiting an an extension range our outdoor signage print services. Bratts have been manufacturing specialist access equipment in Nottingham since 1895. 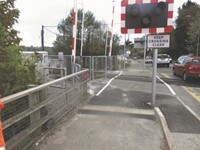 Designing products in non-conductive Glassfibre and Timber, as well as Aluminium, Steel and Stainless Steel, our range covers all WAH (Work at Height) jobs, from trench access, pole work, stiles (live wire crossing) and working steps to station platforms, bridges, inside and on top of carriages. Our designs enable manual handling, durability and safety as standard – one Electricity company is still using our Timber ladders we supplied 28 years ago! We make for Network Rail, W. Mids Railway, Southern, E Mids and others, as well as rolling stock / depot users Alstom/Virgin, Siemens, Bombardier, Great Western and London Underground. We are currently designing a platform with Balfour Beatty Ireland for maintenance work over Irish Rail carriages. Aquarius Rail is planning to demonstrate how we make railway tasks simple and safe Road to Rail to Site. Our demonstrations will include the quick on and off tracking of the R2R4x4, R2R Trailer & LTE to transport materials, equipment & people from depot to rail. 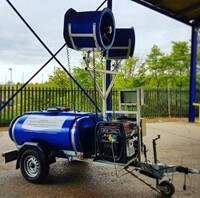 APPS UK will be demonstrating our Pira Duo mobile dust suppression unit that has been successfully used within Rail blockades during the last 12 months in particular. MacRail demonstrating its Fatique360 tool. MacRail will be demonstrating its Fatique360 tool. There will be offering live demonstrations and trial accounts from their stand across both days. NAL Ltd specialise in the manufacture and supply of a wide range of Innovative products to the Rail industry. Their unique Retention Socket foundation system has revolutionised the way in which posts and columns are installed throughout the Network while there new Cabinet Base has simplified the installation and maintenance of all trackside signal cabinets. NCHSR will be demonstrating its virtual reality learning equipment, to give visitors to thier stand an insight into the type of equipment thier learners will use as part of their course. PACE Networks are hosting the Electrification Infrastructure and Power Stand (C3) with partners; Bonomi, Omnia, Morris Line Engineering and Rebosio. The interactive stand will display a range of products from PACE partners and there will be experts available to demonstrate how they work. Engcon will be giving live demonstrations of the versatility and practicality of tiltrotator-equipped excavators in a wide variety of applications.UK owner-operators will be on hand to answer questions about the practicalities and economics of owning an Engcon, together with competitions and much more. wide range of applications within the industry. 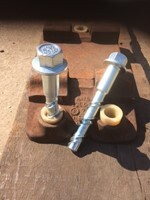 See the unique twin helix Excalibur Sleeper Bolt (Network Rail & London Underground product approvals) being installed into Hardwood Sleepers in a matter of seconds using just a hand held Ratchet Spanner. Also see how the Excalibur Sleeper Bolt can improve your trackside productivity, fixing reliability and workforce welfare, along with providing considerable whole life cost benefits compared to using the traditional AS Screwspikes. Benefit from the associated installation Health & Safety assets of using the Excalibur Sleeper Bolt including reduced Workforce Fatigue, Hand Arm Vibration & Manual Handling of Heavy Machinery/Tools plus reductions of COSHH. Scott Parnell will be demonstrating just how easy it is to install itsArcoSystem 6m Span elevated GRP Trough System on both days of the event at 12:00. Thjey are showcasing the reasons why so many contractors have been using arcoSystem in place of other products and would love for you to be there to witness it for yourselves. 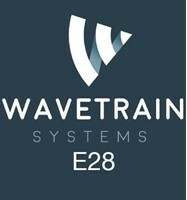 Wavetrain Systems will have a train detection system installed on a track panel at its stand demonstrating a full size system with a Control Unit and Sensors. Here you can see how the system components are connected and how it can be installed. On their stand you can also see a demo-kit visualizing the actual energy in the live rails running continuously. Unattended items are a common occurrence, but how do you know if a misplaced bag is the result of an innocent lapse of concentration or something more sinister? This is where our Specialist Response Unit comes in. They assess unattended packages, bags and substances such as unusual smells, powders, liquids and chemicals to determine whether the item can be cleared as lost property or whether additional specialist resources, such as Explosive Ordnance Disposal experts, are needed. A quick and proportionate response to any potential threat not only protects the safety of passengers and staff, but also ensures that disruption to people’s journeys is minimised. Members of the team will be on hand to showcase their specialist equipment and give an insight into the role of a specialist response officer. The development of forensic science has played a huge part in modern policing, often providing the vital piece of the jigsaw needed to solve a crime. Our Scientific Support Unit plays a vital role in maximising opportunities to catch offenders and bring them before the courts. To find out more about this fascinating world, check out the crime scene tent we will have on our stand to give you a glimpse into the tools and methods used in the recovery of forensic evidence from scenes of crimes and fatalities. It takes years of experience and expertise to police a rail network that serves over 8 million passengers every day. Our Rail Advisory Service is all about sharing that wealth of knowledge to help grow developing railways across the globe. If you’re looking to access support and advice, and benefit from the expertise we have developed, come and have a chat with us. Since their first deployment in February 2012, our armed officers have carried out thousands of station patrols. They help to deter, detect and disrupt a range of criminal activity, including terrorism, and their presence boosts security and enables us to respond quickly to incidents. Our search dog section is the oldest of its kind in the country: our first four dogs - Airedale Terriers Jim, Vic, Mick and Ben - began patrolling Hull Docks in 1908! Since those first tentative paws on patrol more than 100 years ago, dogs have now become a common sight at British stations. Whether ridding the streets of drugs or tackling terrorism by sniffing out explosives, their unique abilities have become increasingly valued in today’s climate and they provide a vital supporting role. As well as carrying out search duties, they can also track suspects from crime scenes, chase and detain offenders, and search for missing people. Retired Police Dog Mojo will be there to greet visitors along with serving police dogs and their handlers. For Rail Live, our firearms and dogs units have teamed up to stage a live demonstration involving the detention of an armed person from a train. From lifting the lid on the tactics used by thieves to giving victims the confidence to report unwanted sexual behaviour, our campaigns really make a difference. Our Citizens in Policing team will be on hand during Rail Live to talk visitors through our current campaigns while highlighting volunteering opportunities and the role of our Special Constabulary. Railway crossing safety will also be covered, with one of our mobile safety vehicles on site and opening its doors for visitors. Working as part of the protestor removal team is a highly skilled discipline which requires officers to remove demonstrators who have locked or glued themselves to infrastructure or blocked a highway in protest to an event. Our team is trained in the use of mechanical, hydraulic, electronic and chemical tools to help them remove protestors. We will be involved in a number of demonstrations during Rail Live, giving visitors the unique opportunity to witness at close quarters the tactics and skills used in safely removing locked-on protesters who may be blocking the railway, vehicles or a vulnerable site. Formed almost 15 years ago, after protesters brought the Docklands Light Railway to a standstill in 2003, our policing at heights team continues to grow, both in numbers and technical ability. They are routinely used to carry out searches at height, body recovery or interventions with suicidal people in precarious places. They were also deployed to major incidents such as the London terror attacks of 2005, Drax power station - where 26 protesters locked themselves onto a coal train – and, more recently, the Manchester Arena terror attack, where the team recovered items from the ceiling and infrastructure of the building that would otherwise have been lost to the investigation. During Rail Live, we will be demonstrating the skills needed to safely remove a protester who has trespassed onto a train roof.